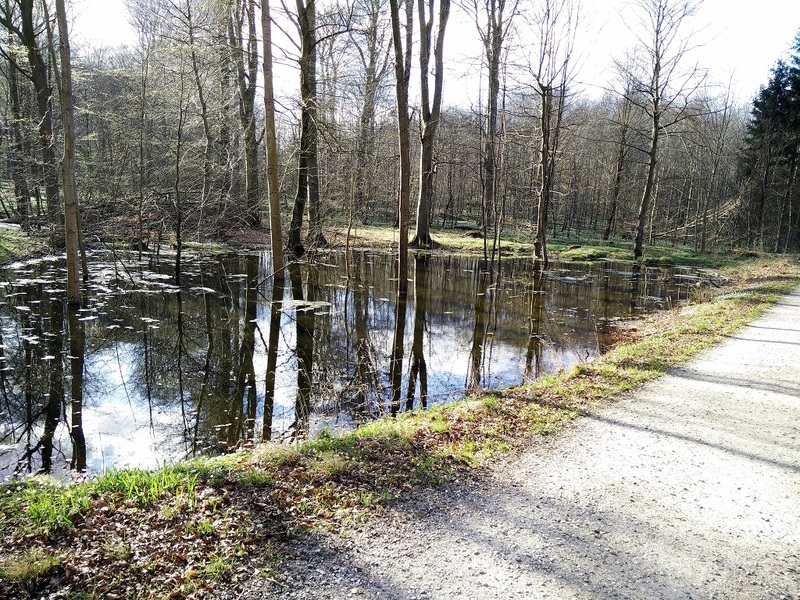 At first glance Denmark does not have much nature to offer to hikers and other outdoor enthusiasts. 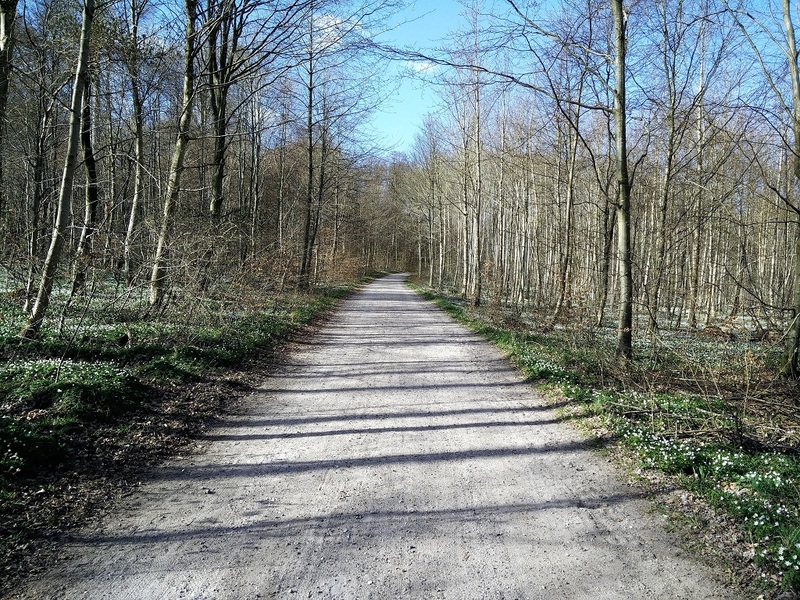 However, with some effort you can find good hiking trails also in Denmark. 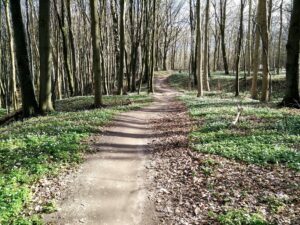 We have done some great hikes in the National Park Mols Bjerge in the past months, but this time we wanted to go hiking somewhere closer to Aarhus, the second biggest city in Denmark. 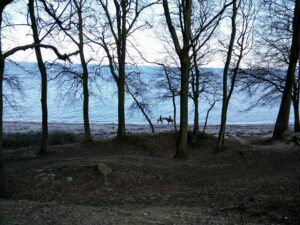 After a bit of research, we figured out that the area south of Aarhus features several interesting trails along the coast. We quickly planned an approximately eight kilometers long circle route that starts at Moesgaard Strand (Moesgaard Beach) and goes south along the coast through a lovely forest which overlooks the sea. On a sunny Sunday afternoon, we executed this hike which we conveniently named the Moesgaard Strand trail. The trail takes you from Moesgaard Strand towards Meriendal Strand and back. Obviously, the terrain is relatively flat in this area and therefore this hike is perfect for families with kids and those who wish for less demanding trails. If you are into mountain biking, you can also do this trail with a bike. For hiking, you don’t need any special equipment since the pathways are pretty trimmed, but do remember to bring water, snacks and windproof clothing. Strong winds are not rare in this area. In the summertime, a small grill bar called Moesgaard Strandkiosk is open at the starting point where you can enjoy an ice cream or Danish hot dog before or after your hike. 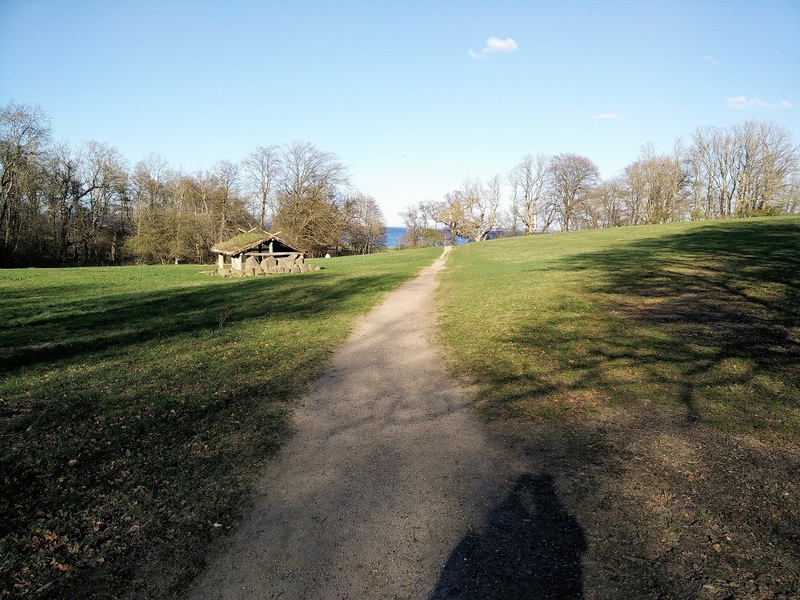 This trail starts at the Moesgaard beach parking place which is located 8.8 kilometers away from Aarhus city center. We came to the Moesgaard beach by car but on weekends you can also reach it by public transport. 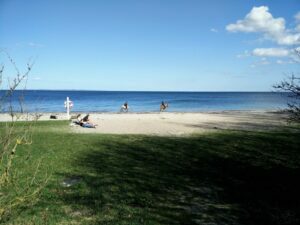 If you decide to go to Moesgaard beach by public transport, you should check out the Danish travel planning website Rejseplanen to find the best route on any given date and time. The website will also show you an estimated price for the journey. First you will have to reach Aarhus and then take bus number 31 which drives from Aarhus main bus station to Moesgaard beach. Note that this bus line operates only on Saturdays and Sundays. 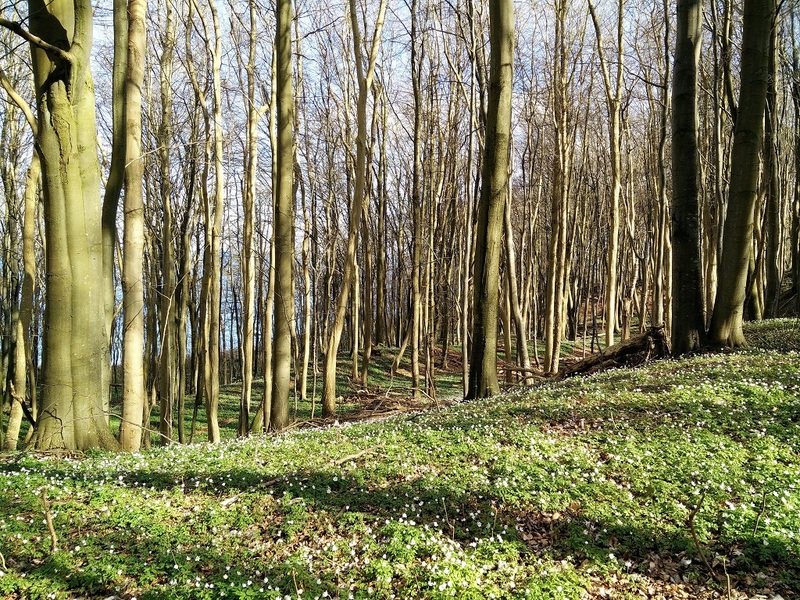 If you are arriving by car, you should first drive to Aarhus. In Aarhus you should continue driving south towards Malling and Odder on Oddervej but only till you reach the direction sign for Moesgaard. Here turn left and keep driving on a narrow road for approximately 800 meters. You will reach the Moesgaard museum and the road will split into two here. Turn left and after driving for approximately 500 meters the road will again split into two. Take the left road again and after driving on this road for one kilometer you will come to a crossroad. Turn right and drive until you reach the parking place at Moesgaard beach (approximately one kilometer). 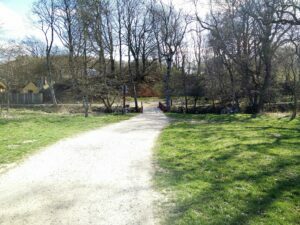 An approximate address is Strandskovvej 21, 8270 Højbjerg. The coordinates for the parking place are 56.0889, 10.2472. You can park your car there free of charge and the GPX route attached above starts exactly at this parking place. 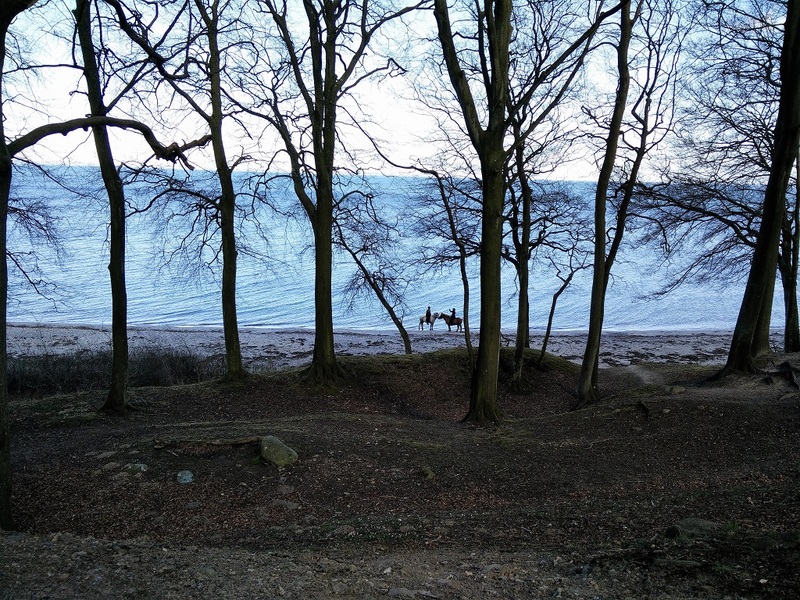 From Aarhus center it will take you approximately 25 minutes to reach Moesgaard beach by car. The trail takes you south along the coast towards Meriendal beach and then back. All the way there are generally 2-3 parallel paths which sometimes merge (a walking path right next to the sea, a wide dirt track further inland and a walking path between them) and it is of course also possible to walk directly on the sandy beach. 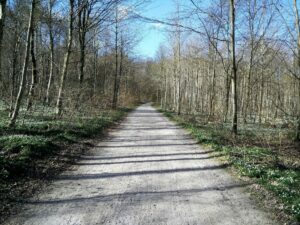 There is thus zero chance to get lost in this area but if you want to stick to our route we do recommend using our GPX track (with a smartphone, GPS device or a GPS watch) which you can download for free above. To learn more about GPX tracks check out the article What are GPS track and how to use them for hiking. From the parking place start walking on the wide dirt track that goes towards south and soon you will reach a small bridge over a creek next to a picturesque old Danish house. Cross the creek and continue hiking on the wide dirt track. After the bridge the wide dirt track will start ascending gently and from here you can get a great view on Aarhus bay. In nice weather (which is rather rare in Denmark) you can even see Samsoe island and Fejrup peninsula. Soon you will see a narrow path on your left that runs parallel to the wide dirt track, but closer to the sea and we do recommend taking this narrow path because the wide dirt track is quite busy with mountain bikers. The narrow path will take you south along the coast and through the light deciduous forest. After hiking for 3.5 kilometers altogether the narrow path will merge with the wide dirt track. Stay on the wide dirt track for 200 meters or so and you will arrive to a small parking place. 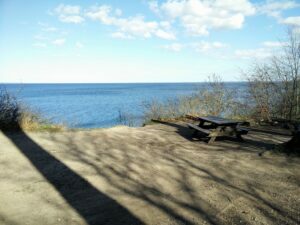 The forest running along the coast will thin out and turn into a meadow with benches and tables. Here you will have a great view on the coast which makes it a great spot for a lunch break. On your left you will see stairs down to the beach. The trail (wide dirt track) then goes towards west for 400 meters and then towards north. Stay on the wide dirt track that goes north until you have hiked 7.3 kilometers altogether. Then you will see a narrow path on your right. Take this narrow path which will lead you east, back to the coast. From here it will take you approximately 15 minutes to reach the parking place at Moesgaard beach. Because the weather was nice, and I knew that this hike would be short and easy, I didn’t take too many things with me. 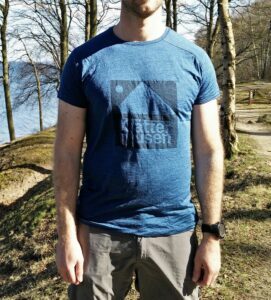 I was wearing the Klattermusen Eir T-Shirt and Montane Terra Pack pants. 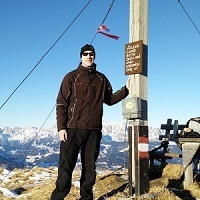 Instead of the Salewa Mountain Trainer Mid hiking boots which I typically wear on hiking trips, I was wearing the Lowa Innox GTX hiking shoes which proved themselves perfect for such an easy trail. In my Osprey Talon 44 backpack I was carrying fleece jackets for both of us, food, water and some accessories. The Klattermusen Eir T-Shirt is made of Merino wool and silk fibers. 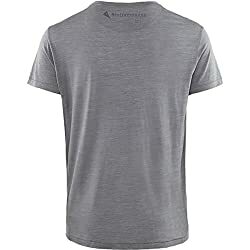 The t-shirt is very breathable, quick-drying and comfortable to the touch. Unlike synthetic base layers, it also doesn’t get smelly, no matter how long you wear it. As for the durability, the silk fibers make it more tear-resistant. I’ve had the t-shirt for half of a year now and I haven’t noticed any tears or other defects. As the fabric is relatively thin, it is also perfect for warm summer days. 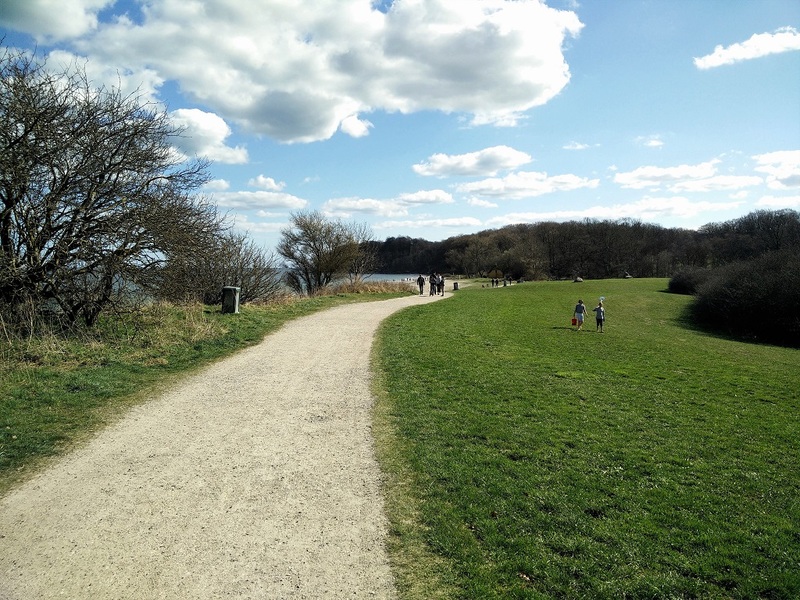 The Moesgaard Strand trail is a great option for those who live in Aarhus or other cities in the proximity to Aarhus. It is an easy hike and thus it is also suitable for families with kids and those who are not particularly fit – not least because you can lengthen or shorten it according to your wishes. In the heat of summer, you might be even able to make a stop for a short swim in the sea. 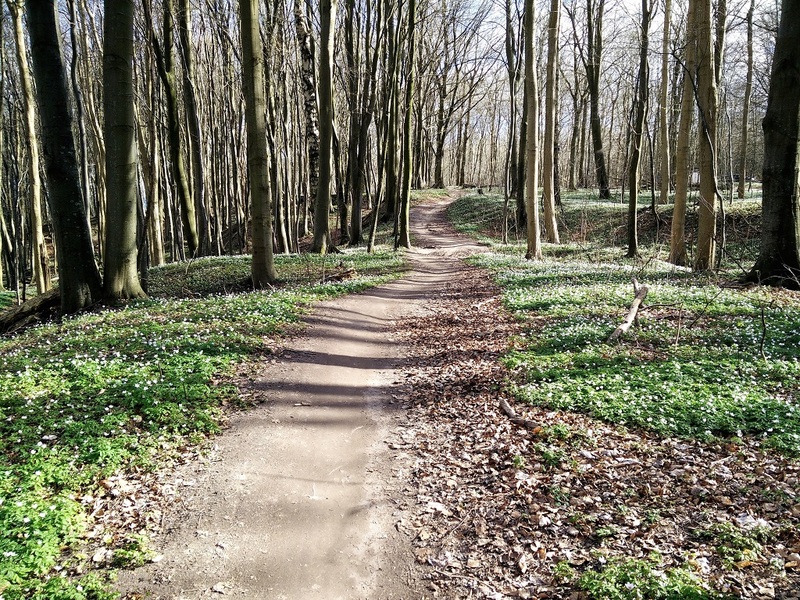 If you decide to do this hike we also recommend visiting the Moesgaard Museum which is located only two kilometers away from the starting point.